For pet-owners, furniture shopping has never been easy. Trying to find home decor that ticks the boxes for beautiful and comfortable is hard enough, but when you add on trying to find something durable enough to withstand pet playtime? Next to impossible. Luckily, we’re familiar with that struggle and are here to help. There is truly no “pet-proof” furniture out there, but there is furniture that is best suited to a life with pets. 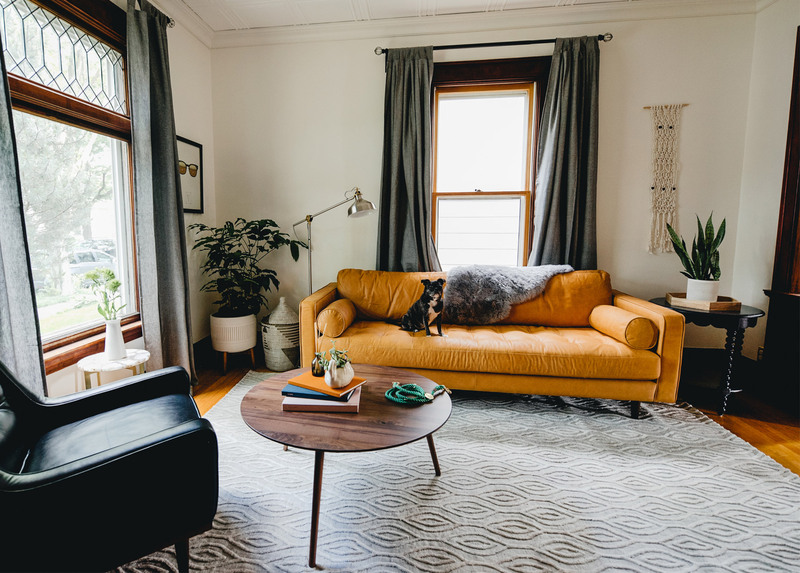 So we teamed up with the expert on pet parent life, Ahmed El-Shourbagy of Dogs of Instagram, to navigate creating a pet-friendly home that doesn’t sacrifice style or comfort. 1. The Ultimate Pet-Friendly Sofa. Ahmed says leather is by far the easiest material to keep clean and maintain when your pet’s drool situation gets out of control. The best part? Like his own pup Lucy, the leather will only get better with age. Full-aniline options like Charme arrive to your door with a beautifully worn appearance complete with natural variations. Pet scratches can easily be buffed out and more stubborn scratches will simply add to the character and beautiful patina that our full-grain leathers achieve over time. For more durability, semi-aniline leather is the best option. Articles made from Oxford leather are more resilient due to a wax coating that not only makes your leather color more uniform and saturated but guards against any accidents that may occur — like, say, during that training period. Chemical Spill: While we know stain-resistant treated fabrics exist, we believe that exposure to these types of chemicals isn’t beneficial to anyone — even animals. Our approach is to offer real materials that are chemical and flame retardant free, combined with sharing best practices on maintenance and care for your articles when life’s inevitable little spills happen. 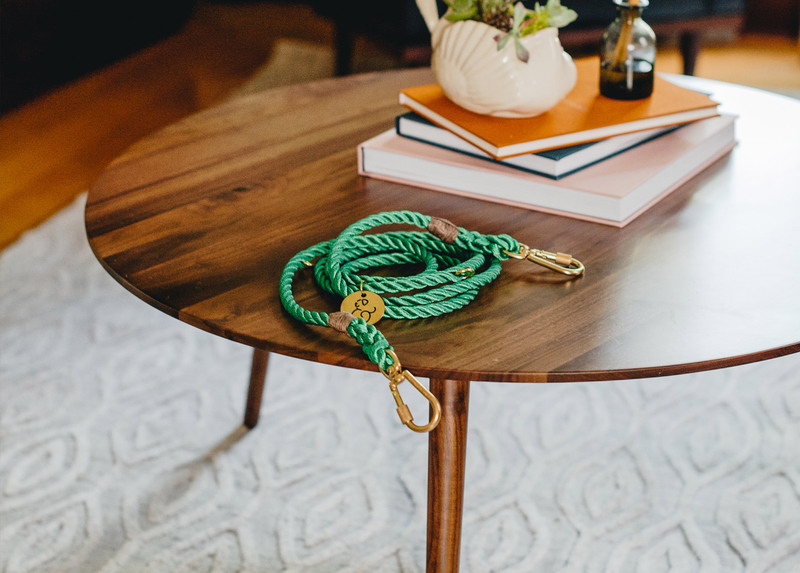 When playtime gets a little rough, you’ll be grateful for a sturdy coffee table that can survive an indoor game of fetch. Ahmed suggests choosing tables that keep things out of head’s-, paw’s-, and tail’s-reach. A solid wood table like Amoeba makes for a sturdy option that won’t tip over if it gets knocked during playtime and its round shape leaves no sharp corners to bump into. Like many, Ahmed and Lucy have a thing with floors — and making sure they’re as pet-friendly as possible. 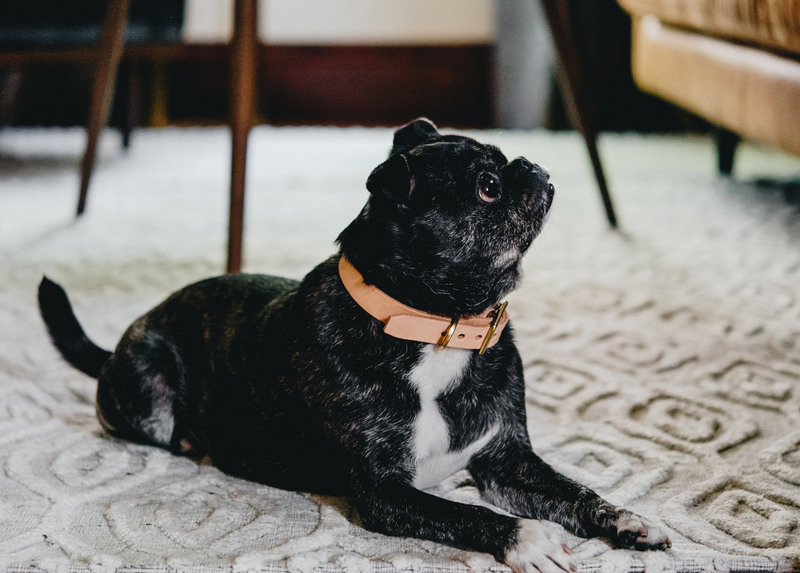 Adding a rug to hardwood floors not only prevents pet scratches, but can also provide that missing finishing touch of cosiness, color, or texture your space needs. Bring durable, outdoor-friendly fabrics in like jute or rugs with a low pile like the pictured Ayin that won’t trap lint, but have a great pattern that will distract from dirt. Avoid high-pile carpets like shag or thick knits that claws or nails can easily dig into and loosen. The Dogs of Instagram founder says another key tip is to avoid carpet when possible as wall-to-wall carpeting traps odors, dirt, and fallen fur. Drool marks and scratches are an inevitable part of dog ownership — but it’s much easier to clean a pillowcase or throw than trying to shove a sofa into a washing machine (though if you have one that size, we’d love to borrow it). 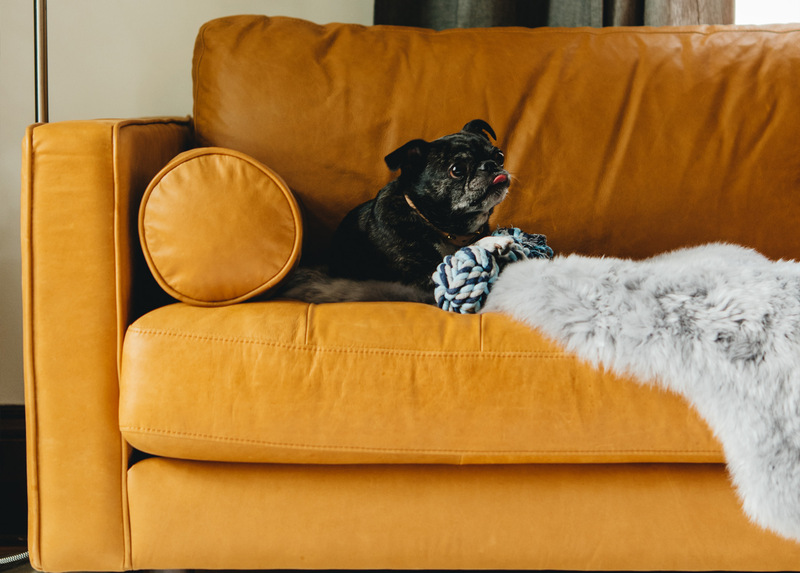 Ahmed suggests protecting your seats with options like cozy sheepskin or warm, alpaca throws to give a little extra cushioning and to create a more maintainable barrier between your pup and sofa. Tip: You won’t want to share, so pick up an extra one that’s designated human only. 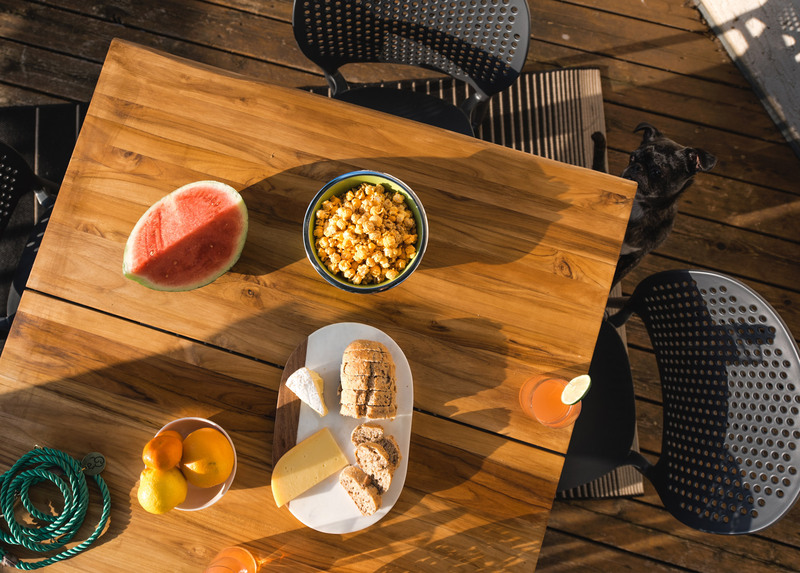 A big part of dog ownership is embracing an active lifestyle (we’ll count taking Fido out at 2:00am for a bathroom break as “exercise” in between regular walks) and a love for the outdoors, so ensure that your outdoor furniture is as pet-friendly as its indoor counterparts. Ahmed suggest choosing furniture that is unlikely to stain and easy to clean like wipeable polypropylene, durable teak, or galvanized steel. 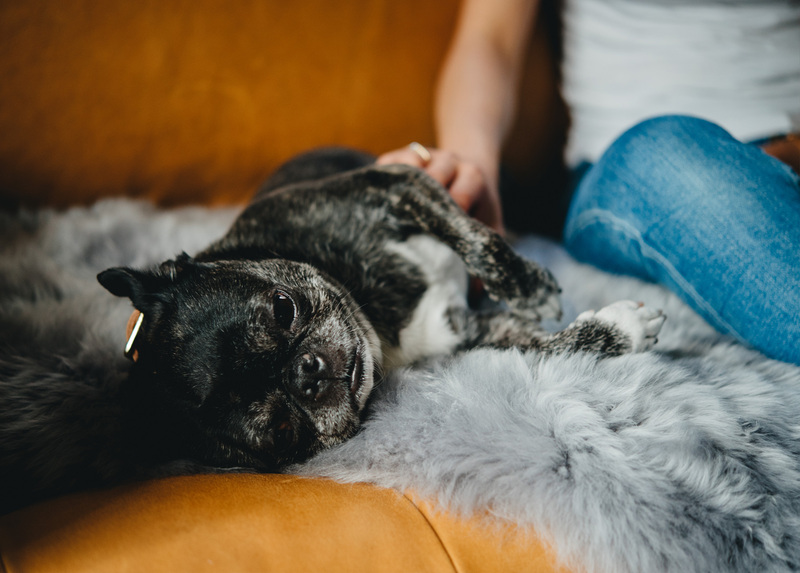 Any dog owner will agree that the benefits of dog life totally outweigh costs — even if it means spending a little more on that leather sofa instead of fabric. Ready to redecorate your dog’s home? Shop our collection for articles your pup will appreciate just as much as you.